It has been quite a bit of time since Winter! We apologize for the delay, but the prizes are being handed out shortly! Trophies will be handed out as well! April 14, 2019 - Weekly Raffle Results! The results are in! The winner for this weeks raffle was MyMeloChan! Congratulations! The winning pot was 50,185,975 tu. The raffle has been reset, and you may now buy tickets for next weeks drawing. Remember, the starting pot is always 25,000,000TU, so grab your tickets for a chance to win! April 7, 2019 - Weekly Raffle Results! The results are in! The winner for this weeks raffle was Blackgothfox! Congratulations! The winning pot was 51,068,125 tu. Do you like Liyure? How about FREE Liyure? Well, would you like to win an Albino Liyure? Then it's your lucky day! 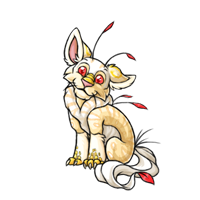 Thanks to the very generous Kittykat, we are raffling off an Albino Liyure! To enter, all you have to do is go to this link. The last day to enter will be on April 20th, 2019, at 11:59:59 pm RST. The winner will be announced shortly after. Good luck!